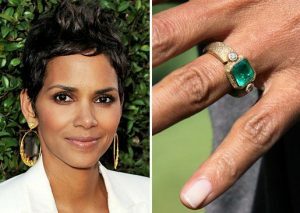 Coloured gemstone engagement rings are having their moment, with royals and celebrities leading the way with this latest trend. They are beautiful, unusual and make your ring stand out. Coloured gemstones can help make your engagement ring more unique and help put your distinctive style on a piece. As early as 1796, Napoleon Bonaparte gave his future empress, Josephine, a sapphire and diamond ring for their engagement. Today, we see Kate Middleton, the Duchess of Cambridge, with one of the most famous engagement rings with a 12 carat sapphire encircled by diamonds. Gemstones can make a ring more personal by choosing a stone with meaning, such as a birthstone of yours or your partners, historic symbolism of the stone (for example, a sapphire is traditionally associated with sincerity, truth and faithfulness) or colour which means something special. Beyond rubies and sapphires, gems that are less well known are usually significantly less expensive. If you want to add colour, style and size to your engagement ring, coloured gemstones are a fantastic way to do this. Durability is high on the list of considerations when finding your engagement ring gemstone. Different gemstones have properties and different tolerances against daily wear. Gems must be able to withstand bumps, bangs, heat, light and household chemicals. We can determine the quality of the coloured gemstone much like we do with a colourless diamond by using the 4Cs; colour, clarity, cut and carat. Colour is the most important when choosing your coloured gemstone, there is no universal grading system to evaluate clarity and cut may vary greatly from stone to stone. High quality coloured diamonds are rare, so there is a premium on top quality coloured stones. It is worthwhile to compare a number of gemstones before you pick your final choice, it helps in understanding the varying quality factors and how they affect value. As with colourless diamonds, always ask for a Coloured Stone Identification Report by a trusted authority, such as GIA. This will be unbiased and will validate the gem’s identity and include a detailed description of its size, colour and measurements, along with a colour photograph.